ALQOSH, Iraq (RNS) Basima al-Safar retouches a picture of Jesus on an easel outside her house overlooking the flat Nineveh plains, 30 miles north of Mosul. The murals she paints tell the story of her people, Christians in Iraq. But with Islamic State militants nearby, she is worried that life in Alqosh and towns like it could soon come to an end. The Assyrian Christian town of around 6,000 people sits on a hill below the seventh-century Rabban Hormizd Monastery, temporarily closed because of the security situation. Residents of Alqosh fled this summer ahead of Islamic State militants. 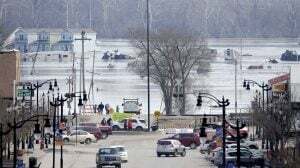 Around 70 percent of the town’s residents have since returned. Still, a sense of unease hangs in the air. Below the monastery in the boarded up bazaar a lone shopkeeper waits for customers. At the edge of town local Christian fighters staff lookout posts, checking for danger. 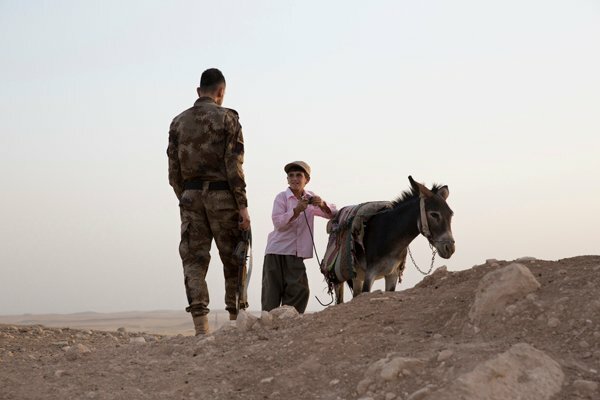 With Islamic State fighters just 10 miles away, these men and most residents of the town are scared that they may have to flee again. 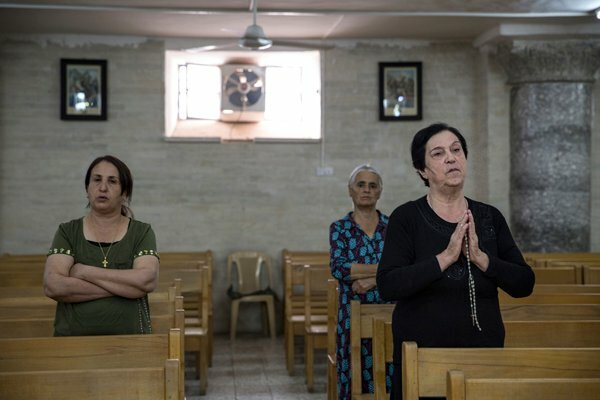 In August, the Christian town of Qaraqosh, 18 miles east of Mosul, was overrun, along with neighboring villages, home to Iraqi Christian communities for centuries. Islamic State forces came close but never entered Alqosh. Al-Safar, who has been painting murals of Christian life for 34 years, was born in Alqosh and shares her brightly painted home with her cousin and nephew. Earlier this summer, like many of the town’s residents, she fled to Dohuk, a Kurdish city on the north of Iraq. “When I returned Alqosh was like a ghost town,” she said. She began decorating her house with religious murals after the death of her mother three years ago. But now she looks at her depictions of biblical figures, potted plants, feasts and angels and wonders if she will ever paint again. Before 2003, there were an estimated 1.5 million Christians in Iraq. These days, about 400,000 remain. In July, Christians fled Mosul in droves after Islamic State militants gave them an ultimatum to convert, pay a tax or be killed. Mrayma and Athra Mansour, two Christian brothers, are trying to adjust to the new circumstances. Athra Mansour used to teach the Syriac language to children in neighbouring Tel Isqof. “Tel Isqof is empty now,” he explained, sipping a small cup of coffee. Mrayma Mansour, who used to work as a local disc jockey and has since taken up arms as part of a fledgling Christian militia, said he wants international protection for his people, in the form of a safe zone, weapons and training. “If this doesn’t happen I will get my passport, family and try to go to another country because it won’t be safe,” he said. Thaer Saeed echoes the frustration. At 4:30, the St. George Church bells chime. A few women and children gather for the service led by Deacon Salim Qoda. Most of the aisles are empty. Prayers are read in the ancient Syriac language, a dialect of Aramaic believed to have been spoken by Jesus. Back in her home, al-Safar smokes a cigarette and reflects. The only peace that will come to Iraq, and the few meek ones who still live there as well as living in fear, will come from God’s kingdom or heavenly government (Daniel 2:44), as well as to the rest of the world, with Jesus as its King (Isaiah 11:1-9). May the Lord continue to bless His people. 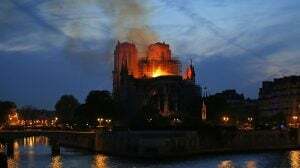 Christians should not have to live under Islamic laws, Islamic governments, powerful imams and anti west propaganda anymore. ISIS was a sign they need to be free. God help them find a way.